The Only Choice Locksmith is YOUR residential locksmith in Sunrise. 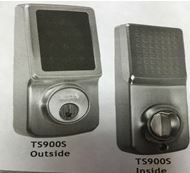 We provide Mobile Locksmith service in Sunrise and throughout Broward, Palm Beach and Miami Dade County. Click on the coupon below to print and take advantage of these great savings! 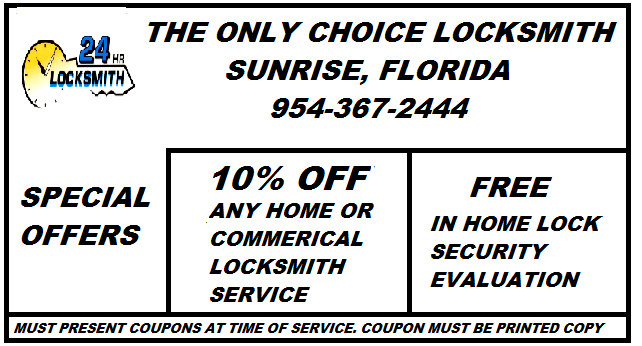 Call The Only Choice Locksmith in Sunrise, FL at (954) 367-2444 for all of your locksmith needs! Our mobile locksmith unit has expanded! We can now service our customers in as little as 15 minutes in emergency situations. NOW THAT'S FAST SERVICE! Moving into a new home or starting a new business? We can provide you with a FREE ON-SITE QUOTE for all of your residential locksmith and commercial locksmith needs.